The photograph attached was taken by the crew on board the Columbia during its last mission, on a cloudless day. The picture is of Europe and Africa when the sun is setting. Half of the picture is in night. The bright dots you see are the cities' lights. 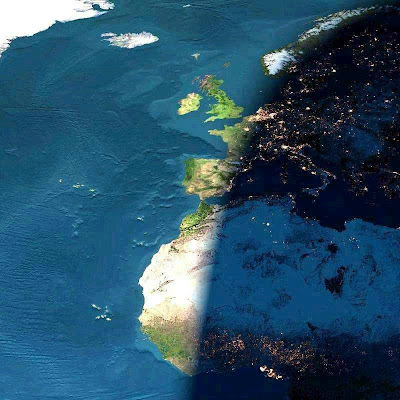 Note that the lights are already on in Holland , Paris , and Barcelona, and that's it's still daylight in Dublin , London , Lisbon , and Madrid .